Saso Blazic received his B.Sc., M. Sc., and Ph. D. degrees in 1996, 1999, and 2002, respectively, from the Faculty of Electrical Engineering, University of Ljubljana. 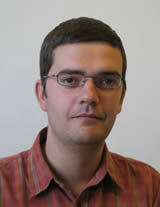 He is currently a Professor with the University of Ljubljana. From 2010 he has been partly employed by the Slovenian Centre of Excellence for Space Sciences and Technologies (SPACE-SI). His research interests include control and modelling of nonlinear dynamical systems. In recent years the focus of his work is directed towards autonomous mobile systems and satellites where the areas of formation flying control and visual based satellite attitude control should be mentioned. Prof. Blazic is a member of the design group of the NEMO HD mission (cooperation between the SPACE-SI and the University of Toronto Space Flight Laboratory). He was a member of the group from SPACE-SI that performed several experiments on the Prisma mission (OHB Sweden). He published 46 papers in peer-reviewed journals (among those 28 in journals with impact factor). From 2010 he is serving as a president of the Automatic Control Society which is a regular member of the International Federation of Automatic Control (IFAC).